JCB International Co., Ltd. (JCBI), the international operations subsidiary of JCB, the only global payment brand based in Japan, and Adyen, the global provider of international and omni-channel payment solutions, are pleased to announce their partnership to enable Adyen merchants in 28 European countries to accept payments both online and in stores from over 84 million JCB card members worldwide. In 1981 JCB became the only Japan-based payment card brand to go global, and since then JCBI has been steadily growing its presence in Europe by expanding its merchant network. Currently, card members can pay with JCB card at about 26 million merchants worldwide including several million merchants in Europe. The Netherlands is a strategically important country for JCBI, as this is a major destination market for European JCB card members, whilst in France, Adyen will be the first JCB Licensee to be able to offer JCB acceptance to French merchants. The partnership with Adyen is key for the expansion of JCB in France and will improve the card acceptance for JCB cardmembers visiting this country. Adyen offers a full service model including front end solutions with ready-to-use check out pages for online and payment terminal solutions for point of sale, all connecting to its best in class processing and risk management payment platform. 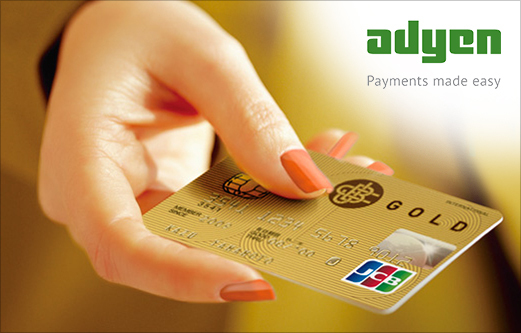 On the back end, Adyen offers full payment reconciliation, detailed reporting and settlements. Adyen holds acquiring licenses for all major debit and credit cards and continues to expand this capability by adding JCB. This partnership enables JCBI to further develop its penetration in Europe.